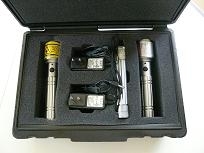 This is two of our three cold laser sets (regular price is $895 each). You save about $200 by buying two sets. 1. The three diode infrared 808nm/300mW Vetrolaser. For treating deep tissues such as muscles, tendons and joints. Rechargeable. 2. The six diode red 650nm/5mW laser. For treating large skin areas such as large wounds on a horse’s leg. Rechargeable. 3. The single diode 650nm/5mw laser. For treating small skin areas and acupuncture points. 4. A pair of safety goggles. 5. Horse and dog chiropractic adjusting DVD’s. 7. Two extra rechargealbe batteries. 11. Acupuncture treatment formulas, and charts (horse, dog, and cat). 12. 1 year warranty and 30 day money back guaranteee.